It’s June and when June falls upon us, I always dream of the long summer days ahead, BBQ smells in the back yard, and the kids running around the grass chasing bubbles with squeals of laughter in the air. This June is no different. We haven’t had the best of weather lately so when the sun peaked out this morning I set my mind to the task of throwing our very first family bbq of the year. The kids needed some fresh air being cooped up indoors lately and I longed to use our new patio furniture again. There is something magical about a bbq and the joy it brings people. Have you ever noticed, no one is ever miserable at a bbq. You don’t have to have a reason to throw one or have friends or family visiting. 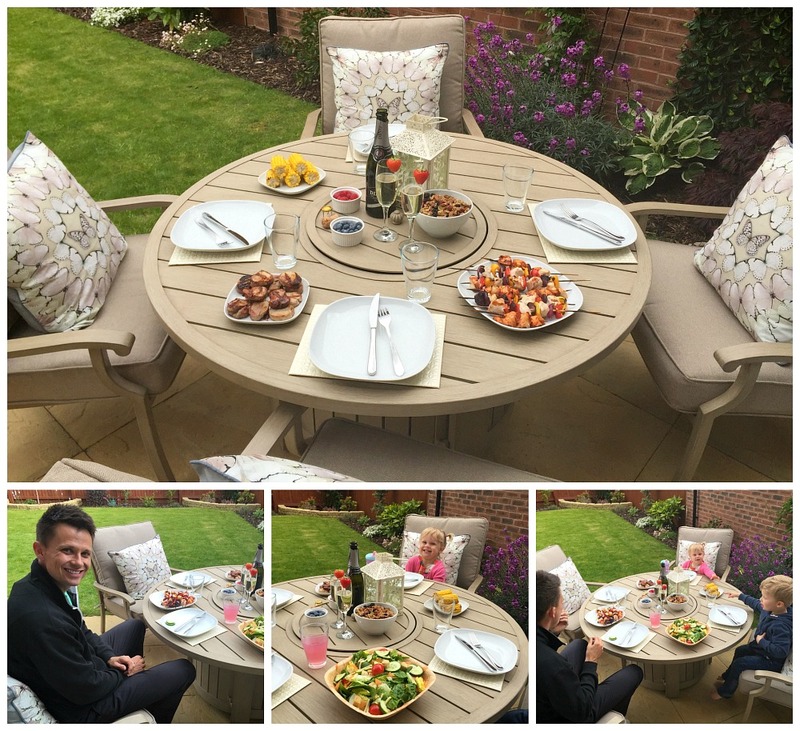 Why not just have the immediate family out together for an ordinary summer’s night dining outside. This is what we do as much as possible if it’s not raining during the summer. It’s good for the kids to be outdoors and not inside glued to the tv. That’s what winter is for. The food always tastes better off a bbq full of that charcoal coating and smokey flavor. 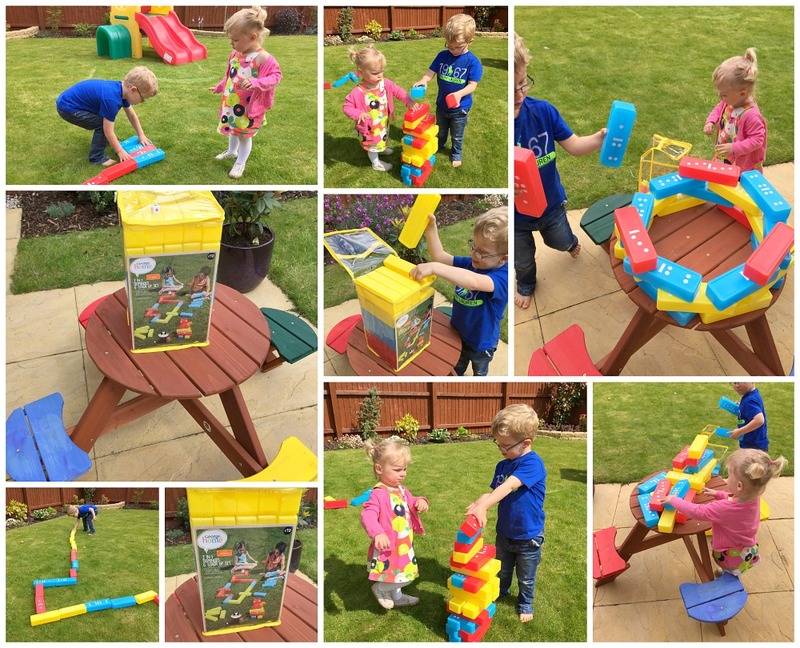 We were so grateful to be sent these amazing Asda outdoor blocks for kids. They have such a huge range of outdoor fun toys for all ages. 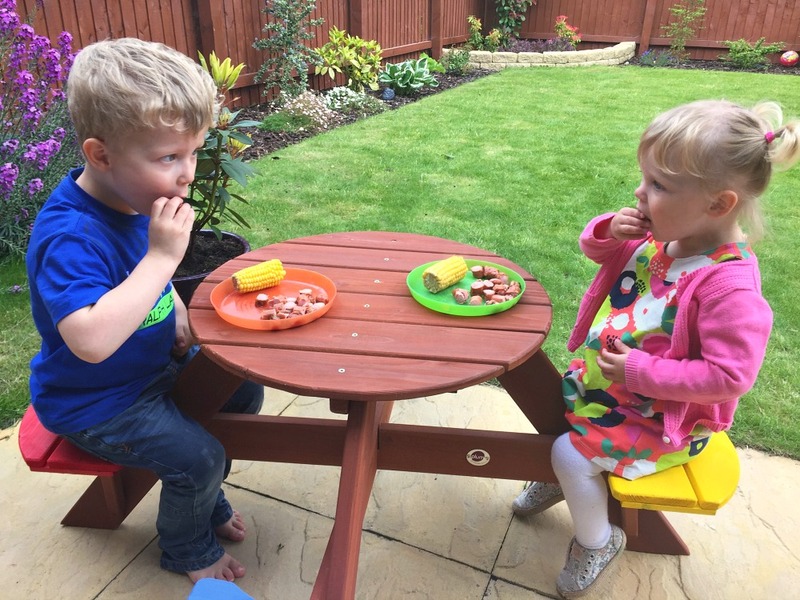 The kids loved stacking them on their new Asda outdoor picnic table and seeing who could build the best circle around it. Then it was a mission of the longest race track and a weird game that resemble jenga. No matter what they were doing with them they were loving them. 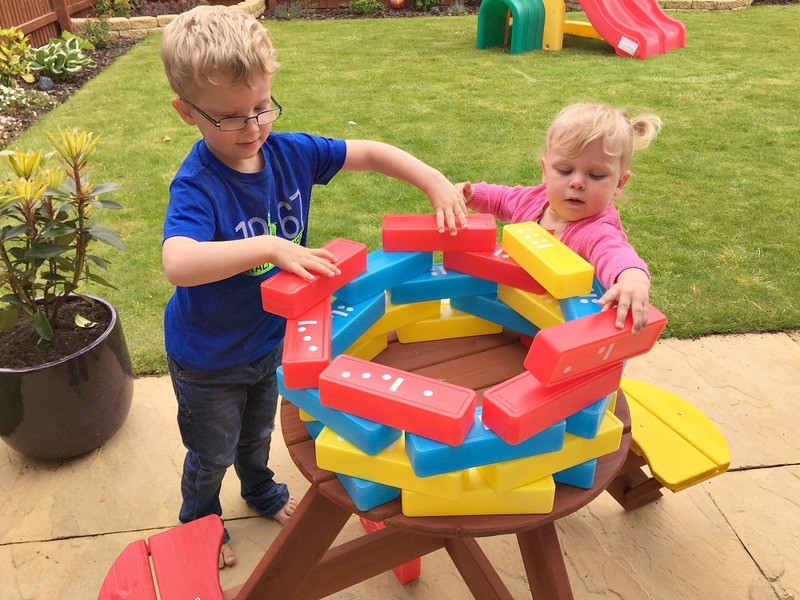 The blocks are vibrant colored and super light plastic so even MM could carry an arm load with ease. We have other outdoor blocks to play with but someone always gets hurt from someone else (*cough big brother) throwing them. Or tripping over them or falling onto them. With these there is none of that to worry about. They wouldn’t hurt even if you lobbed them at someone, not that I am recommending that at all. I love watching the kids use their imagination and see where it takes them. There was roll playing and at one point the blocks became cops and robbers in a high speed chase. A game surely came from nursery this week as it was a first in our household. This is how I remember my childhood summers. Playing outdoors with the sun on our backs and using our imagination. I think the generations below us really need to do more of it. These kids couldn’t have been more in heaven. Every back yard should have a bouncy castle right? Well, our lovely friends kids are getting too old for their amazing toys so we were gifted this amazing pop up and down (in seconds) electric bouncy castle. I was truly so grateful for their hand me down. 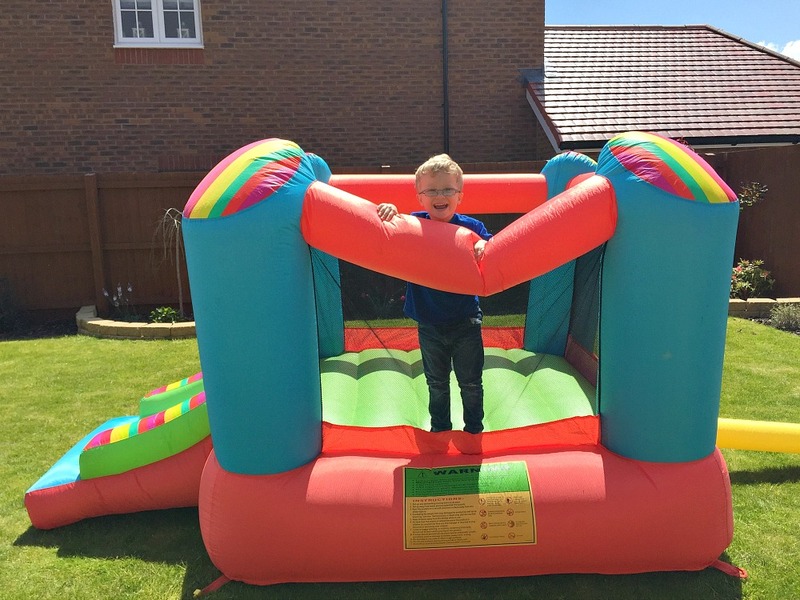 Boy did B light up when we arrived at our friends on Sunday and he was told he gets to take this bouncy castle home forever to keep. He hasn’t stopped talking about the bouncy castle since. He jumped on it literally ALLLLL day today and he still asked me before bed, “can I jump on the castle tomorrow too please?” before he quickly hit the pillow snoring. I must send a huge thank you gift to our friends for giving us since an amazing toy that will knock my kids unconscious at bedtime. SCORE. MM is still scared of the air noise being continuously pumped into it but before summer is over I think she will give it her all. Since we just bought ourselves new adult patio furniture, the kids thought it was amazing that they now have their own kid’s patio furniture. If they are not having their afternoon snack after naptime here at this adorable picnic table they are learning their numbers, drawing and crafting outdoors where crafting belongs. The color seats are a great touch and they both have claimed their two colors and refrain from touching the other’s seats which makes me chuckle. It’s great to have them sitting nearby so I can watch over them while I am cooking on the bbq as it’s on the same side of our back yard. I must have heard a thousand questions coming from them about what I was doing on our bbq and what happens to food when it’s put on a bbq. You know toddlers, but it was one of the most chilled out afternoons I have had in a long time. A much needed chilled out time too with family. The kids seems relaxed and having fun just at home, with just us. Those are my favorite times of all. The picnic table on a whole is great for toddlers. I would say older children the seats would not hold them if they move about a lot. It was definitely a challenge getting all the holes to match up and put together but after a few hours and some blisters on the old hands I had it together and the kids were going mad to try it out. They truly haven’t been off it since. It was an added bonus that it matched our stained fence perfectly too! I think it has truly completed our garden. These little rascals are murder for having any patience. The hotdogs were no sooner thrown on the bbq before they were demanding them and the corn on the cob to be put down on their plates so they could nibble while I finished the rest of our dinner. I had prepared and set out a lovely table arrangement on our big patio table for us all but they just couldn’t wait. Typical but cute. They were there counting who had the most slices of hot dogs and a bigger corn on the cob. Last year, we had to throw our bbq out. It was from our old house, old and rusty and just wasn’t worth keeping anymore. 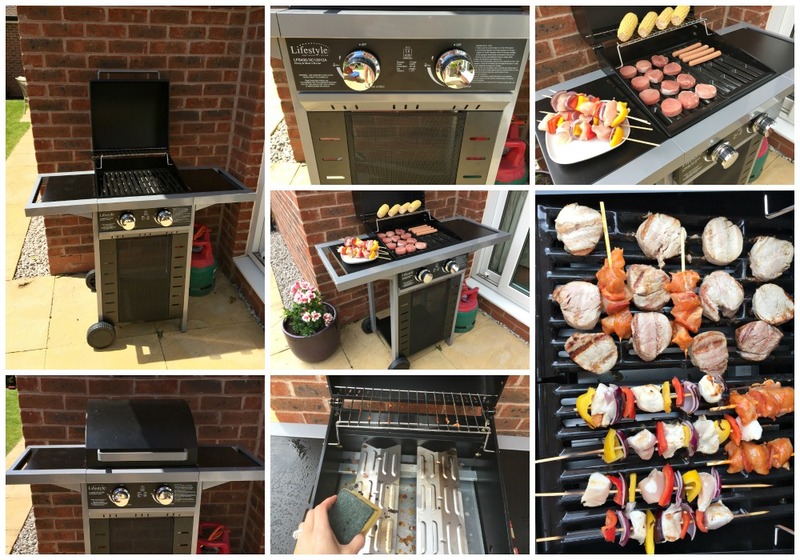 As summer approached I really wanted to get another one as I love cooking outside as much as possible no matter what we are eating. As luck would have it, Wayfair got in touch for #NationalPicnicWeek and reviewing one of their amazing BBQs. I jumped with glee. We are always picnicking outside with the kids so it was perfect for us as a family and great timing too. Everyone should get involved with national picnic week and encourage everyone to get outside more. B’s very first attempt at taking a photo of me… I say he wasn’t too bad. Impressive. Boy’s got skills. The bbq was easy to put together and came in a rather small box which is always impressive. After putting it all together I actually thought it was bigger than expected too. It had plenty of space on both side trays for full size platters as well as space for various meats and veggies on the racks. I immediately ran down the street to get the gas tank filled and get it fired up. 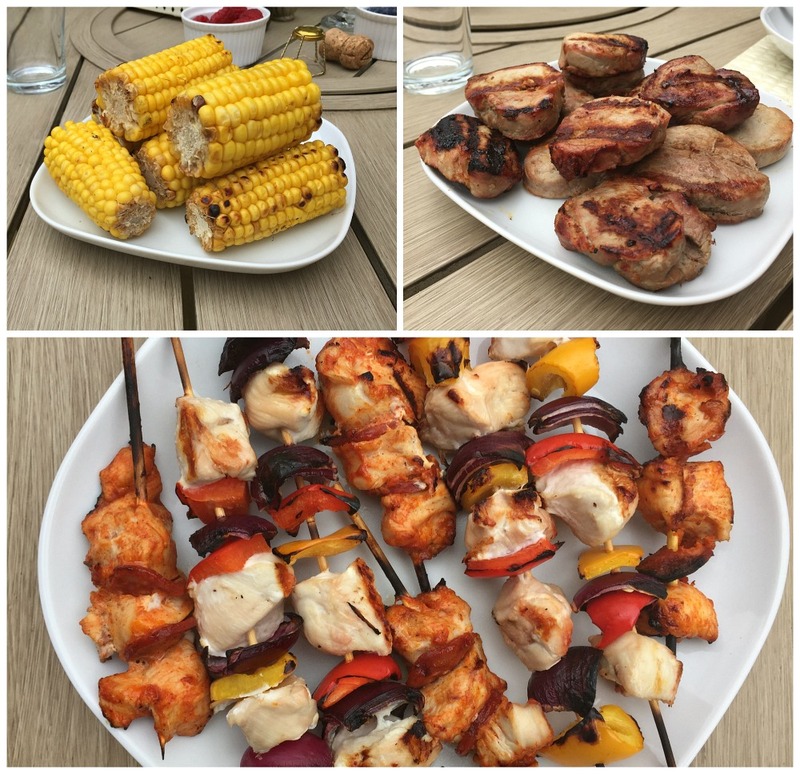 In no time at all I had it loaded with chicken and pepper skewers, hot dogs for the kids, chicken and chorizo skewers with sweet and sour sauce glazed on top, corn on the cob, red onions in honey roasting and tender pork. It cooked evenly with two flame burners underneath and the temperature gauge for both individually so I could cook hotter on one side than the other which is always a plus. Afterwards I could believe how easy the racks came off, and I wiped it clean with a sponge to be ready for the next sunny days use. It had a nonstick layer so I didn’t have to spray it before hand and the food didn’t stick to the rack hardly at all where most bbq you can find most of the food chard straight to it. I like an easy clean up job. As you can see the food turned out perfect grilled, just how we like it. My mouth was salivating just waiting for Mr P to come home from a hard days work and see what we had in store for him. I had also planted a few new plants and flowers that morning and our new cushions arrived to accent our patio table. Cushions are just as great for outdoor living as much as indoor. A full blog post coming soon on my love for outdoor living and a few things we have added to our space outside. 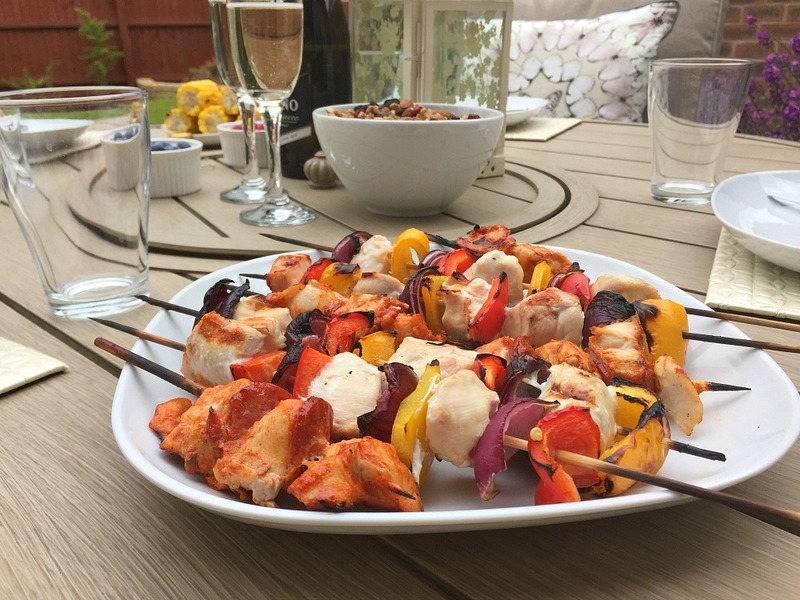 I love surprising Mr P with little things when he least expects it so he came home today with a patio table full of grilled food, prosecco bubbling in a glass, and his kids jumping up and down with glee to see him. The food smelled delicious, the kids had a glow from playing in the sun, and I was sitting back enjoying my family, grateful for their love and this moment together. Life is really about these little moments, ones that are not planned, that come together and stick with you forever. The ones where there is laughter, there is fun, there is food and everyone is happy! * We were sent these products for the purpose of this review but all photos and opinions are my own. Ohhh how cute is that little table, too cute!! I’m so excited for summer. Ive lived in a 2 bedroomed apartment for 11 years, and next weekend we finally move into a 3 bed house with a huge garden and I’m so excited!! 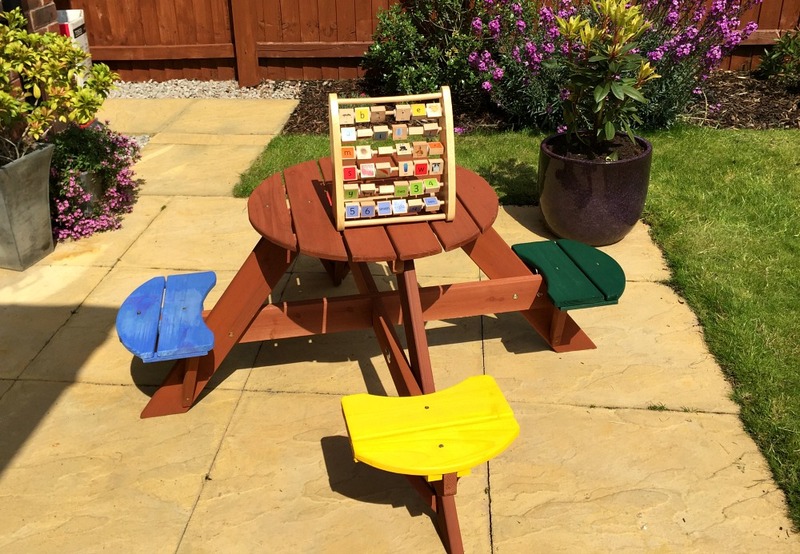 We’ve also been lucky enough to be sent some amazing garden products which is perfect for doing our new garden up!! Oh how very exciting for your big move. That’s amazing. You will love having a garden. That’s exciting about your new garden accessories too. Perfect timing for summer. Thank you. I know Asda is great for outdoor toys, activities and things for kids. Definitely reasonable prices. Perfect for the upcoming summer. Oh wow! 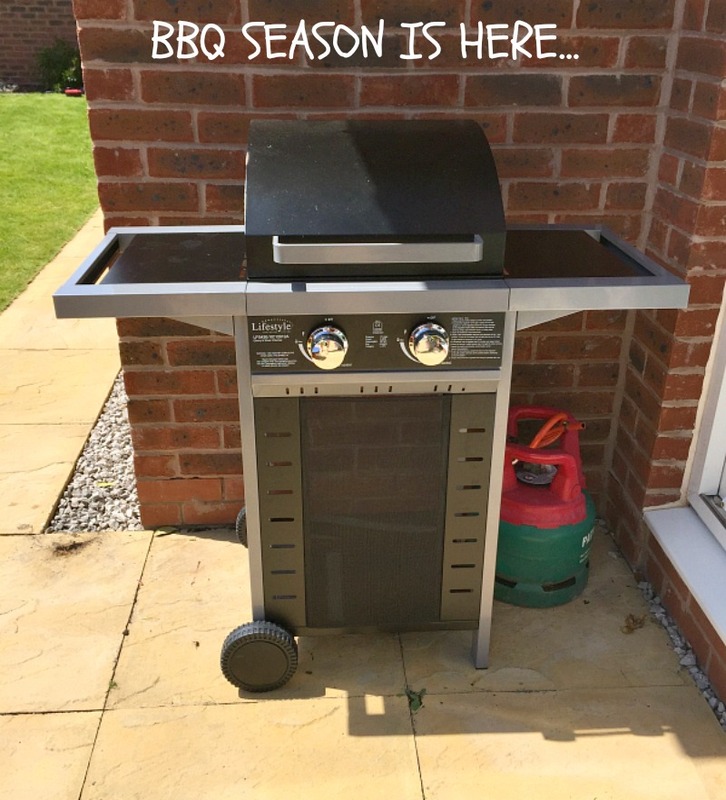 It looks like you have everything you need for the perfect BBQ….. It really was a lovely afternoon, day in fact outside in the sun with the kids. Something we really needed being at home and chilling out together. 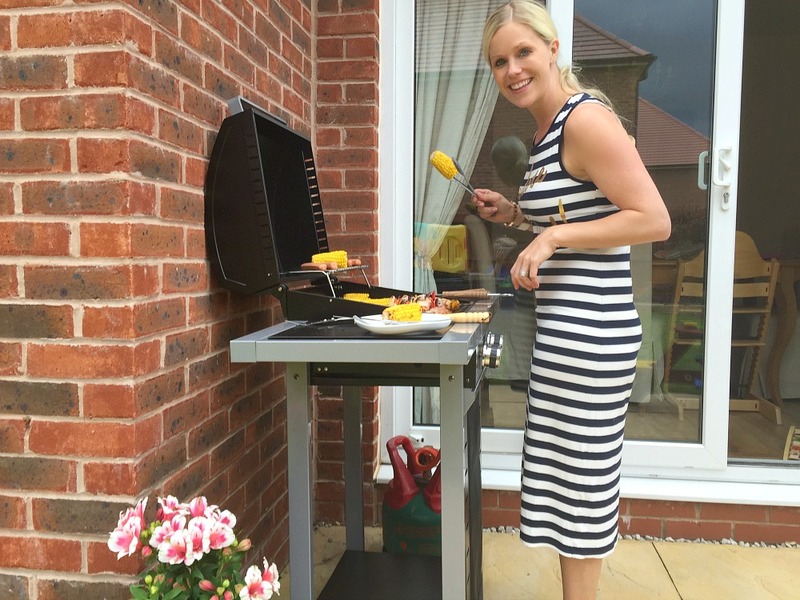 I love bbqs and I’m also a big fan of dining al fresco! Oh and I also love garden games even though our garden isn’t really big enough for all of little T’s toys. Love your photos especially of the food! #triedtested. Thanks can’t beat being outside when it’s nice no matter what its for. 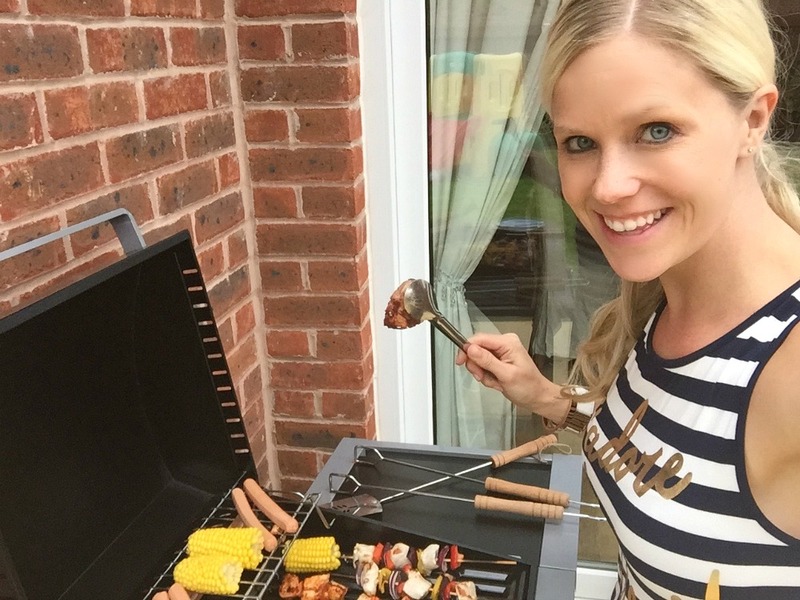 I love a good bbq and al fresco eating too. That’s a lovely kids picnic table. I was sent a BBQ by another company, and after a nightmare finding it (long story), building it (nightmare), I still need to get some gas, and have some decent weather. I’ve never bbq’d before so am a bit scared. Hopefully the OH will be able to work it out! Love your outdoor area and tables etc. Looks a lovely place to spend time. Thank you Emma, the kids love it. Shame we won’t be here most of this year but always perfect for next year. The BBQ was hard to put together in terms of directions being funny took forever but we got there in the end. Good luck with yours. I like that picnic table the kids are sitting on, they just look so adorable on it.